Do you want to be a part of international academic institution, meeting and associating with colleagues and professors from different parts of the world? Do you have a keen eye for detail? We will support your work by giving you all the training necessary to help you make the best out of your internship experience. April – October 2019; exact dates are negotiable. 30-36 hours per week, flexible, occasionally on weekends. 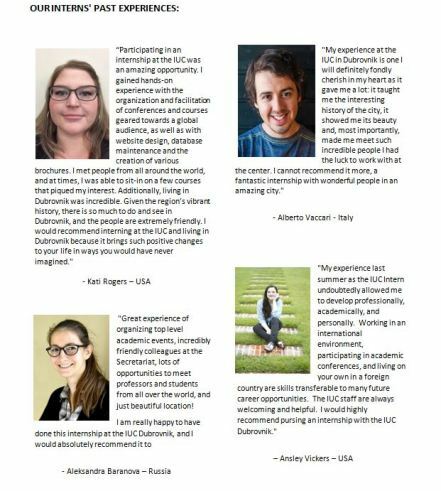 Please note that the IUC is a non-profit organisation and can offer a very limited compensation for the internship, depending on the arrangement. We recommend candidates to look for funding opportunities provided by the EU programmes (i.e. Erasmus+), universities&apos; or independent foundations&apos; grants. The IUC will provide full support for grant applications and may help in search of convenient accommodation. To apply, please send your CV and letter of intention with contact information to IUC Executive Secretary Nada Bruer Ljubišić at nada.bruer@iuc.hr.